The Joyful Honda Group consists of five companies. 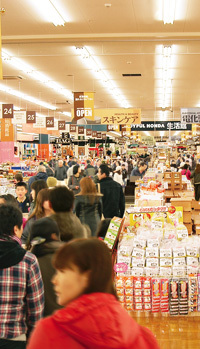 The parent company, Joyful Honda Co., Ltd., has Home Center, Garden Center, and Pet Center. 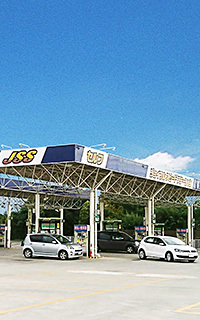 There are four consolidated subsidiaries, namely Honda Sangyo Co., Ltd., which operates arts and crafts mega-stores, Joyful Honda Reform Co., Ltd., which delivers building extension-renovation and landscaping work services, Joyful Athletic Club Co., Ltd., which operates membership sports club, and Joyful Shaken and Tire Center Co., Ltd., which performs shaken mandatory vehicle inspections and servicing and sales and fitting services of tires and other automotive necessities.Taking advantage of the combined capabilities of the group, we have built and are managing and operating our own, distinct areas offering one-stop-shop services to meet our customers’ needs. Specifically, we have built Joyful Honda Towns, on massive sites ranging in area from several hectares to more than a dozen hectares, in which Joyful Honda and its subsidiaries have established their respective stores alongside each other. Our goal in these efforts is to create true “comprehensive home and lifestyle centers” that will assist our customers to solve their problems and fulfil their dreams. With an overwhelming product range and inventory, almost enough to build a whole house, our Home Centers cater not only to the general public, but also to professional tradespeople, selling timber, building materials, paint, tools, hardware, worker essentials, electrical fittings and other materials for home renovation projects. We also offer a wide range of products to meet the needs of everyone from home gardeners to farmers, such as gardening and plumbing supplies, agricultural materials, and engine machinery. Meanwhile, we also stock an extensive range of products for home improvements, including interior furnishings such as wallpaper, carpet and curtains, lighting fixtures, and electrical appliances, as well as daily living essentials, daily consumables, fresh cut flowers, and many other products, including storage goods, stationery and office supplies, outdoor goods, automotive accessories, bicycles, medicines, and alcoholic and non-alcoholic drinks. The centers are divided into well-balanced sections that act as the core of the stores and can compete with any specialist retailer. We also offer a range of services to make it easier for customers to perform their own home repairs and maintenance. These include a “workroom” for cutting timber and the like, a “repair room” where we will repair customers’ power tools, as well as carpet edge-stitching and wallpaper glue application services. Flower seedlings, vegetable seedlings, plants, mulch and other soil for horticulture, fertilizers, plant pots and other gardening supplies, and bricks, paving stones and other landscaping supplies are just some of the extensive range of products stocked in our Garden Centers. 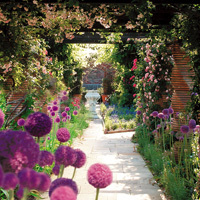 We also provide new proposals for garden creation and product development based strongly on feedback from our customers. We are sticklers for freshness, so as well as buying from markets, we also purchase plants, which are the stars of any garden, directly from producers. Our store layouts include many displays and demonstration gardens, and through a variety of events, container-gardening classes and other activities, we offer our customers the rich enjoyment of the gardening lifestyle. 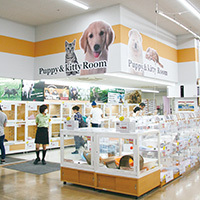 To ensure that our customers can shop at our Pet Centers with peace of mind, every aspect of our pet business, from purchasing of live animals such as dogs, cats, small animals, birds and fish, as well as pet supplies, to sales of animals and supplies, is performed directly by the company. As well as an extensive range of pet-related products, including pet food, cages, and toys, we also offer trimming services by qualified trimmers. Also, in response to requests from customers for a space to wash their own pets, our Pet Centers are now equipped with self-service shower facilities. We are constantly striving to add to our customers’ convenience. Using the internet, we communicate the extensive range of products and abundant knowledge and experience that Joyful Honda has cultivated together with its customers. We are working on strengthening our internet business so we can respond to our customers’ needs and become closer to them. At our Online Shop, customers can purchase a wide range of lifestyle-related products, from the kinds of products that Joyful Honda specializes in, such as specialist materials and proper gardening supplies, to living essentials, interior goods and pet supplies. In particular, we offer our own unique products that differ from other companies, such as full-scale log houses and boutique beers that are brewed in-house. 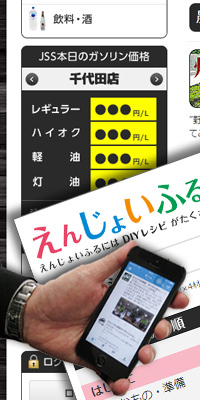 Our information-sharing site, Enjoyful, operates as a communication site, in which customers can upload photographs and videos of their projects according to a certain theme, and other customers and Joyful Honda staff can respond with comments and tips. By bringing together like-minded customers who perhaps want to make something but don’t know what materials they need, or who want to know how to make or use something, or who just want to share what they have made, we hope to give them suggestions for experiencing the fun and joy of making and growing things and creating new lifestyles. Because our stores are located in outer suburban areas, some of our stores operate self-service gasoline stations for the added convenience of the many customers who travel to the stores by car. The gas stations also have kerosene-filling stands. Our motto is to never keep our customers waiting, so we strive to guide our customers in and out of the stations promptly.